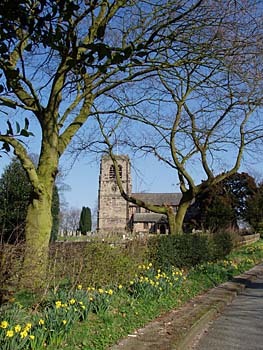 Mobberley's church is dedicated to St. Wilfrid, an Archbishop of York, who died in 708 AD. 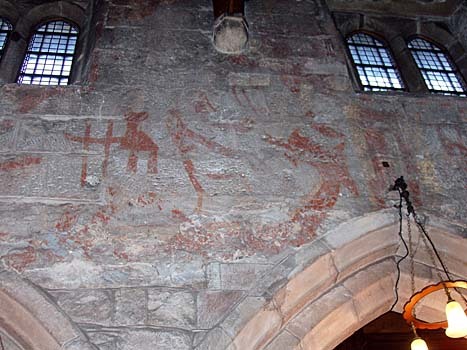 During restoration work in 1888, evidence of a pre-conquest church was uncovered. It is not mentioned in the Domesday Book but much of Cheshire was laid waste by the Normans prior to the survey. The first documentary evidence for the church is in the reign of King John (1199-1216) when Patrick de Mobberley founded a small priory of Augustinian canons to work at the church. The oldest parts of the current church date from 1245. An inscription on the tower shows that it was rebuilt in 1533 by John Talbot of Grafton who employed Richard Plat as his master mason. Masons' marks within the tower show that it was built by the same men that worked on the tower at Nether Alderley. A Green Man can be found on the tower. The chancel and vestry were rebuilt in 1888/9. 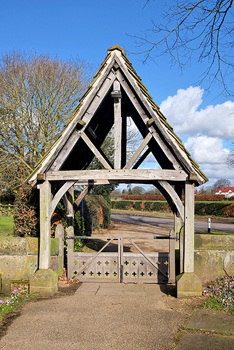 The lych gate has been repaired recently; it was built in 1901 from timbers recovered from an old school. The church was used and served by the Mallory family, as described in the article below. This family provided one of England's greatest heroes. George Leigh Mallory and his climbing partner Andrew Irvine were on the British climbing expedition to Everest in 1924. The two were last seen on 8 June when they appeared to be to going well for the summit after leaving the final camp, at a height above 28,400 feet, but they did not return. George Leigh Mallory's body was found by an expedition in 1999 and recognised by the name tab in his clothes and letters in his pocket. It is not known if they reached the summit. There is a stained glass window commemorating Mallory at Mobberley church. 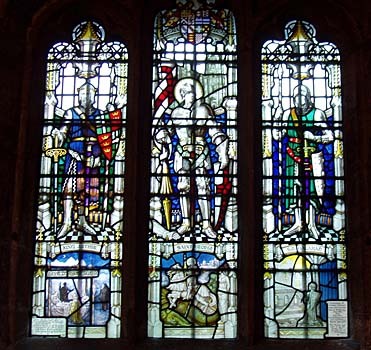 It shows left to right three mythical figures: King Arthur, St. George and Sir Galahad. 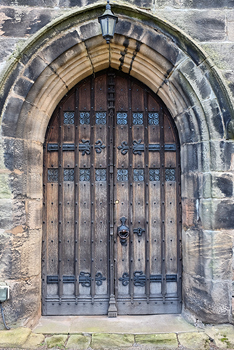 Although I don't have a documentary source, there is a possibility that the large stone just outside the lych gate may be a "resurrection stone", i.e. a heavy stone placed on top of a burial to discourage body snatchers who stole bodies to sell to anatomists. There is a good example at Dean Row Chapel. 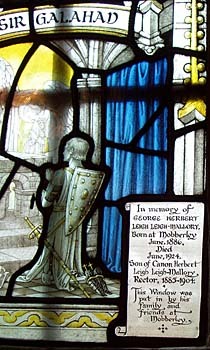 The panel in the lower right of the window reads "In Memory of George Herbert Leigh Leigh-Mallory, born at Mobberley, June 1886, died June 1924, son of Canon Herbert Leigh Leigh-Mallory, Rector, 1885-1904. The window was put in by his family and friends at Mobberley"
Mobberley Old Hall was built in the early 17th century and altered in 1686. It is brick with mullion and transom windows. The new hall dates from 1848. Mobberley remained the seat of the Mallory family until 1900 when it was sold by the Rev. Herbert Leigh Mallory, father of the mountaineer. 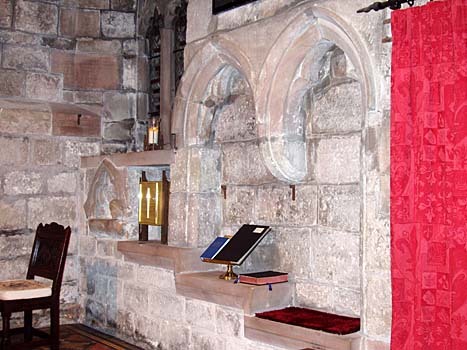 Ian May's lectures at Wilmslow Guild on Old Cheshire Churches. The Mallory family has a long connection with Mobberley. Many were university graduates and Anglican clergy. Thomas Mallory, Dean of Chester was a younger son of Sir William Mallory of Studley in Yorkshire. He purchased the advowson of Mobberley in 1619 from Andrew Carrington of Mobberley. His purchase also included the manor house on the site of the old priory. From the 13th century, the manor had been divided into two halves or moieties. In 1631 Thomas Mallory purchased rights to the other moiety that were in the hands of Sir John Talbot, Earl of Shrewsbury. The family ran out of male heirs in 1664. One of the daughters married a kinsman, possibly her second cousin, also named Mallory. In the early 19th century the family ran out of male heirs again. 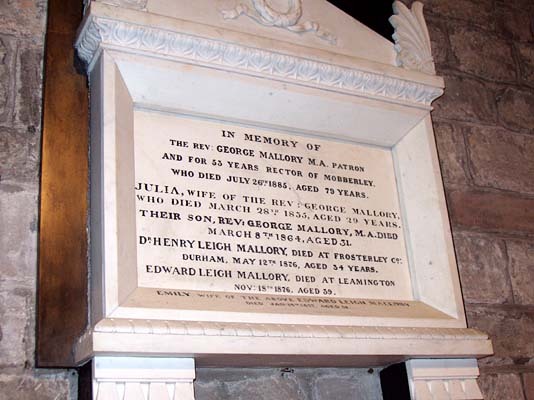 The heiress, Julia, married George Leigh in 1832 and he took the name Mallory. This couple had two children, George, who died unmarried and Harriet. However, Julia died young and George married a second time producing a further seven sons and five daughters. These children were unrelated to the original Mallory family but the eldest son, Edward Leigh Mallory, born in 1837, then succeeded. His younger brothers are shown in Ormerod with the surname Leigh. There is an article The Mallory Family of Mobberley in Cheshire Notes and Queries, N.S., 8, 1908-11, 129-139 covering the 16th and 17th centuries. 1. 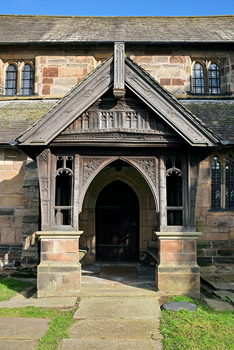 Thomas Mallory, the youngest son of Sir William Mallory of Yorkshire, became Dean of Chester, rector of Davenham and Mobberley. He died in Chester on 3 April 1644. + Elizabeth, daughter of Richard Vaughn, Bishop of Chester. The couple had seven sons and four daughters of whom we follow only the heir, Richard. + Lucy Holland of Hendry Vawn. This couple had three sons and two daughters. 3. Thomas Mallory, eldest son, buried in the chancel at Mobberley, 31 May 1664. + Mary the daughter of William Burgess of Macclesfield at Mobberley on 17 June 1656. They had one son and six daughters in eight years. 4. Thomas Mallory, born 3 June 1657, only son, became rector of Mobberley in 1684 but was deprived in 1690. He died unmarried. 4. Elizabeth, born 3 May 1658. 4. Lucy, born 18 March 1659. 4. Alicia Mallory, born 12 June 1660. + George Mallory, believed to be a grandson or great grandson of Thomas Mallory the Dean of Chester shown in generation 1. above. He was a vicar of Laraughbrian in County Kildare. 5. George Mallory of Mobberley, MA, died 9 April 1732, buried at Mobberley. + Sarah, daughter of John Plumb of Liverpool. They had one son and five daughters. 6. 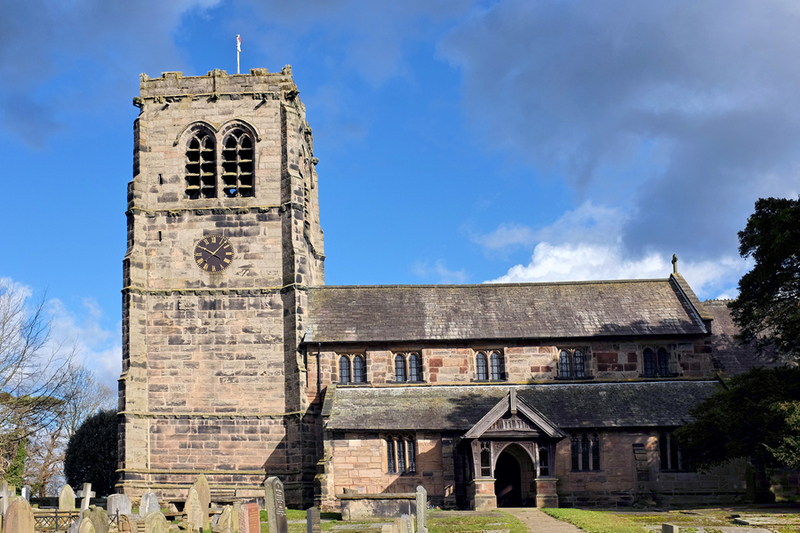 Thomas Mallory, LL.B, rector of Mobberley and vicar of Huyton in Lancashire, born Mobberley, 28 November 1727, died 28 January 1786 at Huyton. + Barbara, daughter of George Farington, Esq. of Wenden and Shaw Hill in Lancashire. 7. George Mallory, died young at Huyton. 7. Thomas Mallory, died young at Liverpool. 7. John Houldsworth Mallory, MA, Rector of Mobberley, Fellow of Collegiate Church of Manchester, died 1832. + Julia, daughter of John Crowder, Esq. of Brotherton, Yorkshire. + George Leigh, MA, born 1806, died 26 July 1886 aged 79. He was the son of George Edward Leigh, MA. He became rector of Mobberley on 26 June 1832 (on the death of his father-in-law) and assumed the name of Mallory the same year. After the death of his first wife he married Henrietta, daughter of Trafford Trafford of Oughtrington Hall on 7 June 1836 and had seven sons and five daughters of whom the eldest, Edward Leigh Mallory, born 4 May 1837, succeeded to the estate. (See memorial below). Children by his first wife were George and Harriet. 9. Harriet, born 6 April 1834 and married 1 October 1861 to Rev. Robert Lloyd. 7. Barbara, died young at Huyton. 4. Mary, born 22 July 1661. 4. Jane, born 2 Dec. 1662.
who died March 28th 1835, aged 29 years. The family tree is adapted from that given in Ormerod, 2nd Edition. He mentions his sources as Sir Peter Leicester, Rev. J. H. Mallory and Rev. George Mallory. BBC film on the 1924 expedition to Everest. I would like to thank the people who showed an educational party from Wilmslow Guild round the church when we called unexpectedly on a Saturday afternoon in November 2004.